Successfully Added 4.3 Inch Portable GPS Navigation System w/ Bluetooth to your Shopping Cart. Portable GPS navigation system with Bluetooth and a 4.3 inch touchscreen for car or handheld use. Have you ever found yourself checking your GPS, talking on the phone, and driving all at the same time? Unless you have three arms, juggling all three of these tasks at the same time is a little difficult. Now, with this handheld GPS navigation unit, you can use one simple device to talk on the phone and check your GPS at the same time! Lost? The CVSB-CS09 is a fully functioning portable GPS navigation system with a built-in loudspeaker, accurate positioning, and no setup time required. Need to make hands-free calls? This device connects to your phone through Bluetooth and supports on-screen dialing, “call history” and “last call” functions that let you keep your eyes on the road and your hands close to the wheel. Looking for a Chinese restaurant in your area? You have good taste! Use this portable navigation system to look up Points of Interest (POI) in your area, then use the on-screen dialing function to inquire about prices or make a reservation. Switching cars? Just pop the portable navigator off one windshield and on to the next. The suction holder is firm, easy to use, and leaves no sticky residue. Going for a walk? Slip the GPS unit out of the holder and into your pocket. Its small size, accurate positioning, and long battery life make it a great GPS unit no matter where you go or how you get there. Got down time? This product is also a media player that supports music, videos and pictures. This GPS unit includes an SD card with simple evaluation GPS maps - you will need to purchase GPS map software for this product to function properly as a navigator. After an extensive review of the available global GPS map providers we have found that the best GPS maps for each region of the world, including Europe, South America, Arabia/Middle East and North America, are usually found in the users own country. Therefore we encourage you to buy or download GPS map software from a supplier in your home country. Can I receive phone calls through the CVSB-CS09’s Bluetooth while I am using the GPS function? Yes! First, pair the CVSB-CS09 with your phone. Then open the GPS navigation system and start driving. If anyone calls you, the CVSB-CS09 will ring and display the phone number of the incoming call. Does this GPS unit work in my country? The CVSB-CS09 portable GPS unit can function in any country. But you will need the GPS maps for your particular country. Does the portable GPS navigation system w/Bluetooth support Greek software? 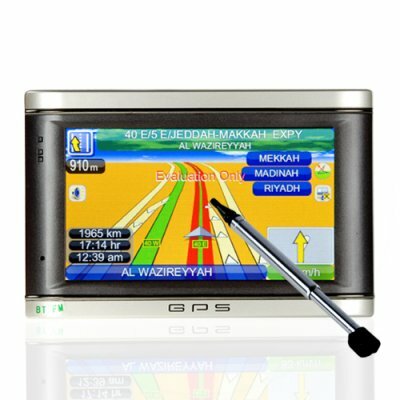 Yes, the portable GPS navigation system supports any language that your GPS software comes in. It's pretty good and works very fine with iGO 8.3.2. application.